"We want to raise funds for a drone," the well-meaning head of an NGO tells me with excitement in her voice. "What do you need a drone for?" I ask. I admire her enthusiasm, but my frustration has also clearly shown in my voice, despite my best efforts. "For anti-poaching of course," comes the confused and slightly irritated reply. "Which part of your strategy requires drones, what type of drone, to do which particular job, and how much will the drone cost?" I ask. The lady flushes, "Well, we are working with [famous former military officer now selling hardware] so-and-so who knows all about them," she answers, now clearly irritated. This is a very common scenario. Involved individuals, governments, and NGOs are usually unclear as to how and what exactly they need to do to slow the massive poaching onslaught. They have no comprehensive doctrine/strategy/tactics/you-name-it for dealing with poaching. Right now, organizations often end up latching onto some expensive technology or some super-warrior as the magic formula. Generally, the feeling is that soldiers are the people for the job, and the troops are being sent in more and more. There are also many programs where serving and former foreign military men train rangers and scouts in weapons handling and battle tactics. This is just not the answer. Most of these troops who go in and cannot find the "enemy" are conventionally trained. They patrol round and round without ever even seeing a poacher. Poachers, although often skilled fighters, are not conducting a military campaign, and they are past masters at not being found. It is a game of cat and mouse, and it needs the right cats! What is really missing and is really needed in this struggle is a comprehensive, intelligent, and pragmatic doctrine that addresses all the problems and offers objective and inexpensive solutions, preferably using existing local resources and personnel. I am absolutely certain that this is possible and that the right doctrine, with the necessary training and implementation, will work. I am certain of this because I have, together with others involved in wildlife protection, developed a doctrine and implemented it successfully. To access a wildlife area requires passing through the adjacent areas, usually on foot. Poachers usually also require the assistance of neighboring communities for caching weapons, transporting food, water, and equipment, and of course for carrying ivory and other spoils. The eyes and ears of the community are an invaluable and effective means of gathering information on poachers' movements into and out of wildlife areas, and in the case of community wildlife areas, within the areas as well. Investigators or scouts /rangers trained in pro-active investigation gather information from the communities, previous poaching activity from the field provided by tracking teams, other organizations and captured poachers and build up a detailed picture of poacher movements. I have been working with Jacob Alekseyev, a former Major in the USAF and Federal Agent in the United States Air Force Office of Special Investigations who has been developing this part of our doctrine and a genius in this field. He has many years experience and the best education and training available for such investigations, and his knowledge has been very much missing from the mix... until now. These movements, once learned and understood, seldom vary to a large degree because they are based on necessity. For example, where to find water or where a cliff cannot be climbed or a croc-infested river cannot be crossed and so on. This narrows down the search area considerably, thus requiring less "boots on the ground." The second problem is how to find the poachers once their movements, area of operations and modus operandi are understood. This requires both surveillance and the world's oldest science: tracking. Children in rural villages in most parts of Sub-Saharan Africa grow up tracking goats and cattle and even wild animals. They have highly developed skills of observation and an innate ability to read sign. This does not mean other people can't do it. It is just like reading, even an adult can learn to do it, but a person who has done it from early childhood will always be more able to become expert at it. During the Colonial and other wars in Africa during the last century, tracking was used as an effective means of finding and following insurgents and anti or counter tracking was used to hide one's presence in an area from casual observers. In fact, it was by far the most successful method of locating unconventional enemy forces and was used on all sides of all conflicts to one degree or another. There is absolutely no difference between the locating of poachers in a wildlife area and the locating of guerrilla fighters in any area. Together with cleverly located observation posts, this is the only really successful way of finding a poacher. Aircraft do not help in this role as poachers are well known to just stand behind a tree and avoid them. There are of course silent, high altitude drones out there, and of course they can play a clear role in surveillance, assuming they can do a better job than the equivalent cost number of highly trained and well equipped trackers, but Africa can't afford thousands of them and and they scare the hell out of our governments, so let's not go there. People who have never seen an expert tracker at work do not usually realize how good they are at it. Imagine a person being able to follow someone's trail with their eyes the way a bloodhound can follow a man's scent trail with his nose. Many can do it at a run with hardly a glance at the ground every once in a while. These people can be trained and their skills developed to a phenomenal degree to the point where they can follow one man's trail into a busy village and out the other side before continuing for days on end. This is my specialty, I have been doing it since I was a little kid, and I have been doing it professionally for the last twenty five or so years. 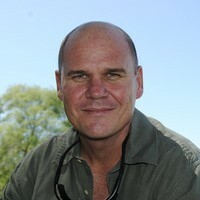 I trained as a professional guide under the Zimbabwe Department of National Parks and Wildlife Management and over the years I have developed my skills tracking both animals and poachers and have also taken a different approach by collecting and studying scientific papers on everything from anthropology to podiatry to forensic science in order to bring my skills into the twenty first century. I have been putting together this part of the doctrine as well as implementing our ideas in the field. The third problem is how to arrest them. It is both hard and dangerous for the trackers to do because when following someone, it is always the follower who is at a disadvantage. The poachers can either try to out-pace you, slow you down by counter-tracking (hiding or disguising spoor), or they can ambush you. The job of the trackers therefore is to locate, follow, and thereafter monitor the movements of the poachers and pass this to the coordinator of the operation. Jacob and I are working with a third writer for this part of the doctrine. Our third contributor has both a background in special forces in the military, and a SWAT background in law-enforcement, but is still working and so chooses to remain anonymous for the security of his family. We believe our combined skills, knowledge, and experience put into writing and taught to wildlife protection personnel all over the continent will make a major difference. Our work is well-advanced and we are almost finished writing a "Field Manual For Anti-Poaching Operations." Once published, we plan to get as many copies as possible into as many hands as possible of people involved in all parts of wildlife protection, in government, NGOs, and as many different parts of Africa. If poachers need tusks and horns, why do they kill the animals, can't they shave the tusk/horn off? Could legalizing the sale of rhino horns actually save the two African Rhino species? Why does poaching for ivory and other materials still continue despite the fact that there is no conclusive medical proof at all for them working?